This medium-sized Grand Auditorium has a lot of character with it's rich-grained mahogany top, Tasmanian Blackwood back and sides, shaded edgeburst top, and all-satin finish. Neo-traditional details such as a Mahogany Neck with Ebony Fingerboard and Taylor's Expression System 2 Electronics make this guitar a versatile and reliable instrument in many different playing scenarios. The sound of this guitar beautifully compliments it's physical design with a clear, punchy midrange that mixes well with other instruments. 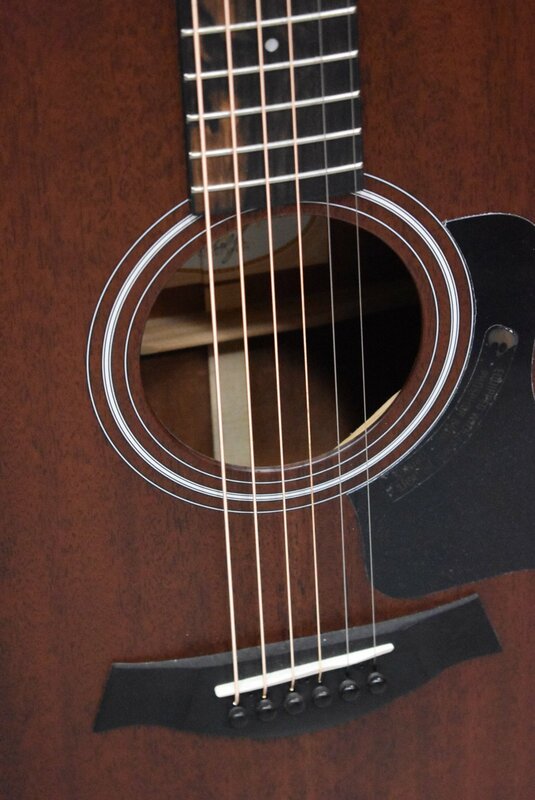 Ships in a Taylor Hardshell Case, MADE IN USA and comes with Lifetime Warranty! Instrument is a NEW OLD STOCK Showroom Display model and comes with Taylor hardshell case and Taylor Factory Warranty. OUR PRICE: $ 1199.00 with FREE SHIPPING to U.S. Addresses.